A superb late 17thc solid oak chest of drawers in original & untouched condition. This is a very rare piece due to its' original state & is therefore a piece for a true purist collector & is quite unusual to find such an untouched piece on the open market. 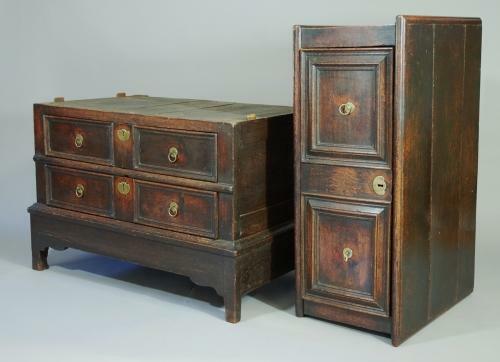 The chest consists of three graduated, moulded drawers (although they have the appearance of six), the top one being of deeper proportion. The side panels have recessed panels & the back is of panelled construction. The chest has been made in two sections, probably to make moving it easier in smaller properties years ago. It has the original handles, escutcheons & locks & it is rare to find a piece in this condition. This was purchased from a private source & found inside a drawer was an invoice from 1935 when it was bought for £8 - 10 shillings. A similar example can be found in 'The Shorter Dictionary of English Furniture' (4th edition 1972) by Ralph Edwards on page 200, plate 8. Further photographs are available of the inside & back etc if required.